Dr. Bernardino Arocha helps women who have thinning hair or balding areas renew their confidence with hair restoration treatments. Houston, TX – Although not frequently discussed, Dr. Bernardino Arocha, a hair loss surgeon in Dallas, Houston, Austin, and New Orleans, says female hair loss is actually more common than most people believe. The American Academy of Dermatology has stated that 40% of women will experience visible hair loss by the time they turn 40 years old. In addition to the obvious cosmetic impact hair loss has on women, Dr. Arocha highlights that female hair loss often correlates with a pronounced loss in confidence. He says advanced hair loss solutions can not only provide help women restore their hair with natural-looking results, but also renew their self-esteem. According to Dr. Arocha, testosterone has traditionally been blamed for the onset of pattern hair loss. However, in the past few decades, scientists have discovered that a high level of dihydrotestosterone (DHT) is actually the cause of this condition. Pattern hair loss occurs when testosterone is converted to DHT. As Dr. Arocha points out, since women have small, naturally-occurring levels of testosterone in their bodies, pattern hair loss can occur in women if the level of dihydrotestosterone spikes. Dr. Arocha notes that female pattern hair loss is only one of many reasons a woman may begin to lose her hair. Common factors that can induce hair loss in women include hormonal fluctuations, stress, pregnancy, menopause, anemia, thyroid conditions, and vitamin or mineral deficiencies. In addition, Dr. Arocha says, some women may also experience hair loss caused by hair styling techniques that damage or break the hair, including braids, ponytails, hair extensions, styling tools, or chemical treatments. Regardless of the cause, Dr. Arocha says a number of available hair loss treatment methods can be very effective for restoring the hair. For some of his patients, he notes that a topical solution such as ROGAINE® can be a sufficient remedy. Other non-surgical options at Dr. Arocha’s practice include Platelet-Rich Plasma Therapy, which utilizes microneedling to stimulate the body’s healing process as well as new hair growth. Surgical options such as follicular unit extraction (FUE) can transfer the patient’s hair from a donor site to the thinning areas for exceptionally natural-looking results, says Dr. Arocha. His patients who choose FUE have typically been able to enjoy a full head of their own naturally-growing hair that can be cut or styled however they please. Ultimately, Dr. Arocha explains, women who are suffering from hair loss should know that it is a very common condition and that advanced treatment options from an experienced hair restoration surgeon can often restore what has been lost with beautiful, long-lasting results. Bernardino Arocha, MD is a board-certified hair restoration surgeon who has performed more than 4,000 hair transplant surgeries. He is a Diplomate of the American Board of Hair Restoration Surgery, a Fellow of the International Society of Hair Restoration Surgery, and an active member of the American Society of Hair Restoration Surgery and the American Academy of Cosmetic Surgery. 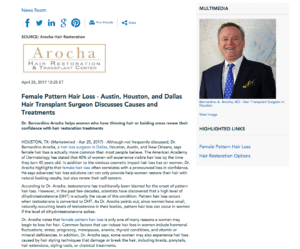 Dr. Arocha is also the Founder and President of Arocha Hair Restoration, a comprehensive hair loss treatment practice with offices in Dallas, Houston, Austin, and New Orleans. He is available for interview upon request.